I went to the Galapagos in April of 2017 for a photo workshop with Bluewater Photography and Travel. 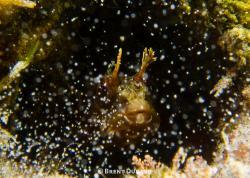 I’m not the most experienced diver or underwater photographer (I hit dive 150 while on the trip), and I had been on one previous workshop, which had mostly been focused on macro. I was shooting with the Olympus 8mm F1.8 fisheye lens on my Olympus OM-D E-M1 rig, meaning that to get a good shot of a skittish pelagic like a hammerhead or a mola, I would need to get reallllly close. That, or risk just ending up with a bunch of "ID Photos" (ie photos that show that I saw <insert subject here>, but that's about it). Well, that sounds easy enough, right? Everyone should just be playing to win all the time. But what I saw on this Galapagos trip, with people of varying levels of experience, is that a large portion of the UW photographers seemed to be playing not to lose more often than not. So why is this? Well, it turns out that humans are impacted much more by losses than by gains, with some studies finding people were impacted twice as much by a loss as by a gain of the same magnitude. Psychologists call this loss aversion, and what it means is if you finish a dive having missed a great opportunity, it can be quite painful! Playing not to lose is a perfect example of this, as it's driven by people wanting to avoid a loss, to avoid missing out. Playing to win, on the other hand, is based on your vision of the perfect photo, and trying your best to achieve that ideal, even if it means missing out on a significant number of lower-quality opportunities. I know what you’re thinking – enough with the psychology already! So let’s get back to underwater photography. We were doing a dive at Wolf. After very poor luck getting close to anything large in 8 dives at Darwin, we were seeing the same thing at Wolf and getting disheartened. So, as we were kicking along, fighting with the current and surge, all of a sudden, a couple of massive eagle rays came around a corner and started heading in our direction! The photographers in our group all rushed towards the first large eagle ray. The guy in the lead was close enough to get in position for a nice shot, and the others getting something, maybe, but nothing really worth showing the group at the end of the day. I thought about playing to win, which meant I needed to be in front of and below one of these beauties, without other divers in the way, and without getting some kind of rushed, blurry shot against a confusing background of rocks. I looked at the path they were taking and took off to get in front of them and position myself where I thought they would swim by. This was in close to the opposite direction of that taken by the other photographers. I got down in the rocks, checked my settings and waited…and then they changed directions and swam off. Rats! Immediately I started to second-guess my plan, because the other divers all had at least one photo of a large eagle ray, and here I was with nothing at all to show from the encounter. But that’s part of the risk of playing to win, which I had to be willing to accept. Over the course of this trip, I had quite a few failures; times where playing to win left me with nothing, rather than a mediocre or even a decent photo. And I never did get a good eagle ray photo. But I also had a number of times where this philosophy gave me some of the best photos I have ever taken. Wolf Island, dive 11 of the trip. Scott, our fearless trip leader, had hammered into our heads the perfect setup for a hammerhead shot. Looking up at an angle towards it, so we can expose the white belly and get an eye in the photo. As close as possible...4-5 feet or even less if we could pull it off. So there we were, creeping towards a school of hammerheads, and trying to balance out bottom time with chances of getting that awesome shot. I had been doing test shots all dive and getting everything prepared, waiting for one good moment...just one good moment, that's all I needed. 11 out of 16 dives at Wolf and Darwin, and I still had zero good hammerhead photos. 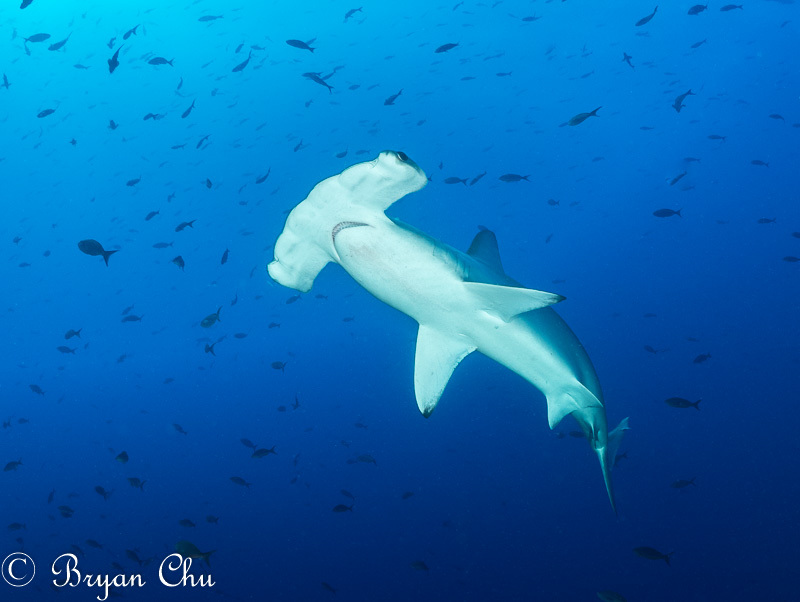 As Scott guided my movements from rock to rock, I got into position, and finally, I saw a hammerhead coming my direction. I knew that if it got spooked, like if someone behind me fired off a strobe, I would miss my shot. I watched it on my viewfinder as it slowly grew bigger with its approach. I slowly raised my rig above my head to get the right angle, made sure the exposure looked OK. It continued to get closer, and I felt the urge to take the picture. My playing not to lose voice was screaming at me. "It’s a good photo! It’s a better photo than you’ve ever taken of a shark! And if you don’t take it right now, you might leave the Galapagos, after 16 dives at Wolf and Darwin, with no hammerhead photos!! Do you want to be a failure?" But I waited a bit longer, as it got even closer. 10 ft. I held my breath. Still too far for my strobes. 8 ft. Still too far, and still too small with the fisheye. 6 ft. Still too far, but I had the focus locked in and everything at the ready. 5, and it was at the perfect angle, coming over my head…this was as good as it was going to get…click! It spooked. I had one shot. I checked my viewfinder – success!! We dove a location called secret cave, which on first glance was dark and not particularly photogenic. But here’s where a second facet of the playing to win mentality came up, which is not so immediate as when trying to capture a skittish hammerhead, but is still very important. My playing not to lose voice was saying "well just get a couple of photos to show you were in a cave and then you're good." So I fired up my strobes to illuminate some area to show what it looked like, and it was mediocre at best. I slowed down and started thinking about alternatives. What would playing to win look like? There weren’t any cool cave formations here. The rocks were fairly bland and a bunch of sediment had been kicked up, so strobes were no use. OK, what about divers silhouetted against the ambient light coming in from the opening to the ocean? That could be interesting. 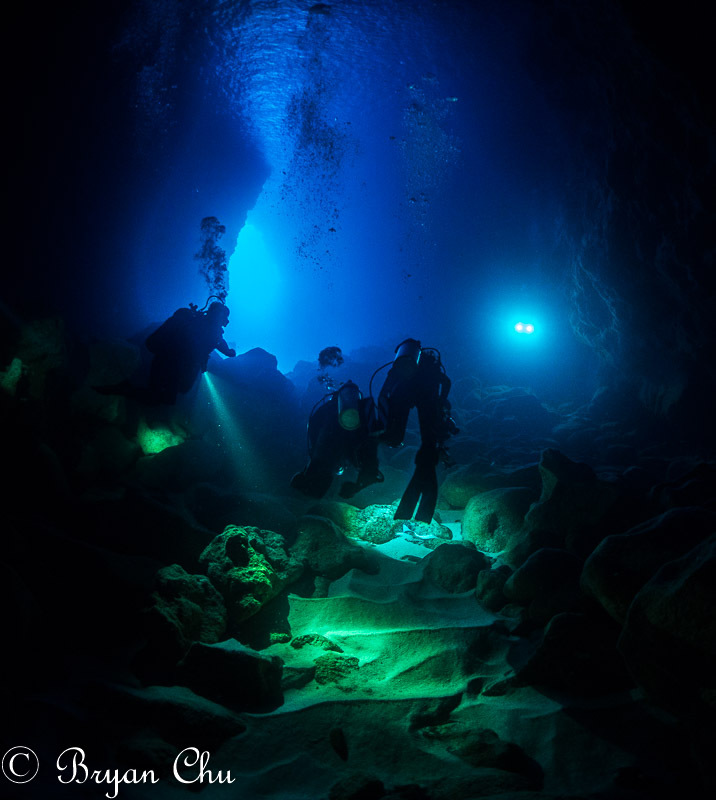 So I turned off my strobes, turned out my dive light and positioned myself behind the group as they headed back out of the cave. I imagine they thought I was a weirdo, if anyone even saw me hanging back in the dark, but that was OK with me. I closed my aperture to darken the diver silhouettes, and as I sat back and waited, I saw a very cool image develop on my viewfinder. Bingo. We were diving Punta Vicente Roca, and it was our second dive of the day at a well established mola mola cleaning station. 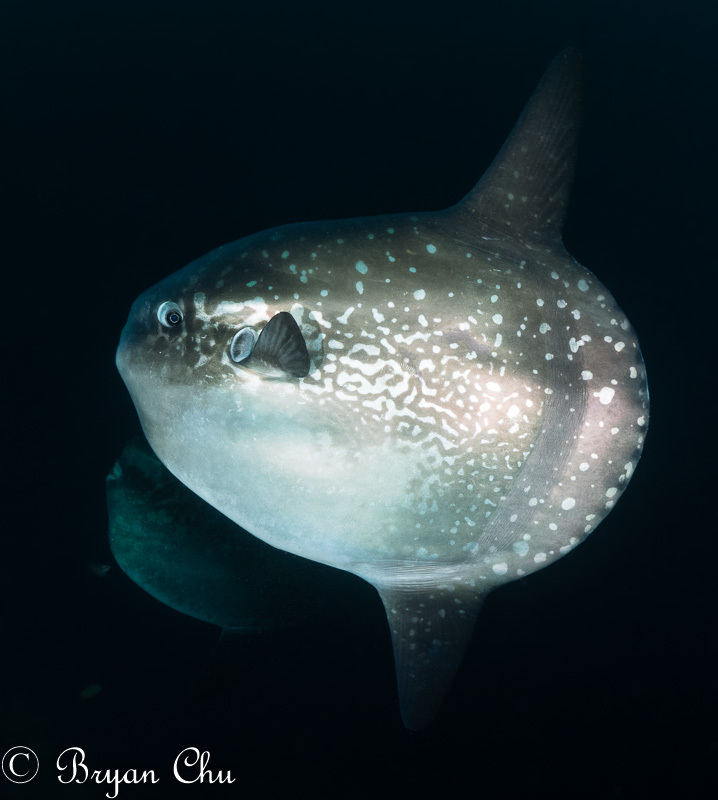 We already had some great mola mola encounters on the first dive. However, in the scrum and mad scramble, with dive computers going off all around as people hit their depth limits, I could not get close enough for a good mola photo. That's another aspect of playing to win, though - know your limits and stay within them. I had about 10 feet deeper to go for a good mola shot when I hit my depth limit, so that was it for me - no mola photo. After that first dive, one of the divers in my group, Mikhail told me about how he stuck around after the first mola encounter by himself. He said that, some time after the rest of the group went on, the mola returned and he had it to himself. I thought about the rest of the dive...schools of fish, sea lions and turtles, which are all cool, but certainly not mola equivalent. What does playing to win look like here? A close encounter with molas, at the expense of all else, clearly. So, back to this second dive. After the initial excitement of a big mola, and getting a couple of decent shots from one who came pretty close, I was feeling good. But I still figured I could do better. The rest of the group headed off, while Mikhail and I waited around. We stayed at a shallower depth to conserve bottom time, and checked back on the cleaning station every now and then. On my third time going down to check, I saw perhaps the most magical moment of my short dive career. Two molas appeared out of the blue ahead of me, decending down to the cleaning station like alien spacecraft. Googly eyes rotating in all directions, they parked themselves vertically, side by side, and waited for their turn being cleaned. I went and grabbed Mikhail, and we went down to the molas by ourselves. They both watched us, eyes spinning crazily, as we approached. Closer, closer, closer...nice and calm, nice and slow, no sudden movements. And then, finally, click. Two molas in one photo, and one of the best diving experiences of my life! After the crazy mola dives at PVR, three of us went on a panga to try snorkeling with penguins. That's another piece of the playing to win mindset - making opportunities when you get a chance. After motoring around the bay for awhile, we finally spotted a penguin darting around near the rocks. Galapagos penguins are notoriously difficult to approach, but we figured it was worth a shot. So, two of us hopped in the water and swam towards the rocks. The penguin swam into a bit of a rocky inlet, which could be accessed by the main entryway to the water, or by reaching over some rocks on the side of it. I was at the part where I could reach over the rocks, and I saw the penguin zipping around in the inlet. The other guy was at the mouth of the inlet. My playing not to lose voice was screaming at me "reach over the rocks and get a photo of that penguin! You need to get a photo right now before it swims off! 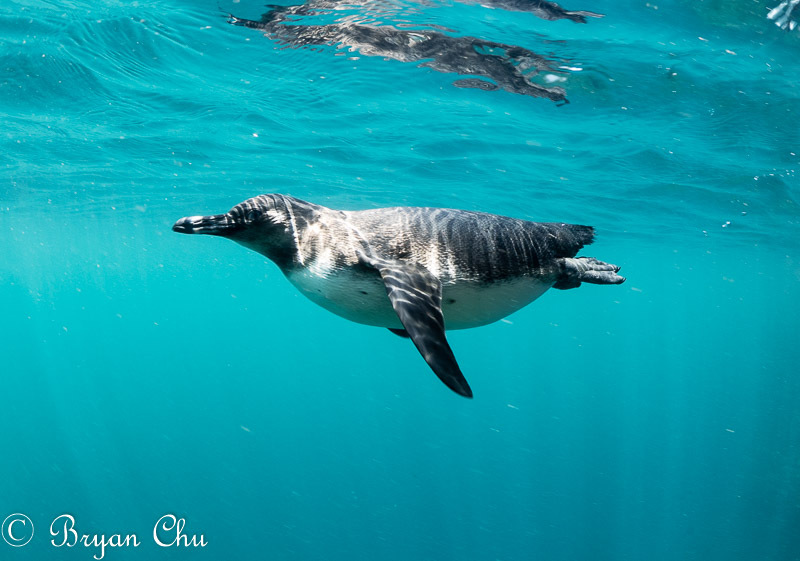 This is your only chance to get a photo of a Galapagos penguin!" But then I thought about what playing to win would look like. That would be a photo with the penguin at the surface, and water in the background, not some random snap of it zipping around against a rock background. So I swam around to the mouth of the inlet, positioned myself, made sure my shutter was fast enough to avoid any motion blur, and then waited. I was worried the penguin would swim below or otherwise evade us, but this was the best chance of getting a winning shot. And the penguin decided to slow down and take a leisurely pass right by the two of us. Yeah!! Cabo Marshall, the last of the really good dives for the trip. We were told there was a good chance to see large mantas. As I had only ever seen a couple from a distance, this was very exciting. 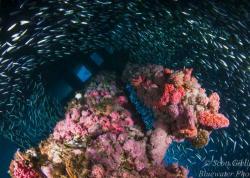 On our second dive of the day the divemaster took us to a small seamount to hang out for a bit. I was not sure why we were there at first, but all of a sudden a big manta passed by! It was too far away for good photos though. A few minutes later, an even larger manta showed up. My dive group all went straight for it in a flurry of kicks and bubbles. My playing not to lose voice was going again. "Big manta, this is your first big manta, you have to go straight for it to get a photo or else you're going to miss it!" By this point it was getting easier to quash, so quash it I did. Thinking about playing to win, I knew I wanted to get right underneath of the manta for that classic shot of the white belly and markings framed in Snell's window. And heading straight for it would not come close to accomplishing that. 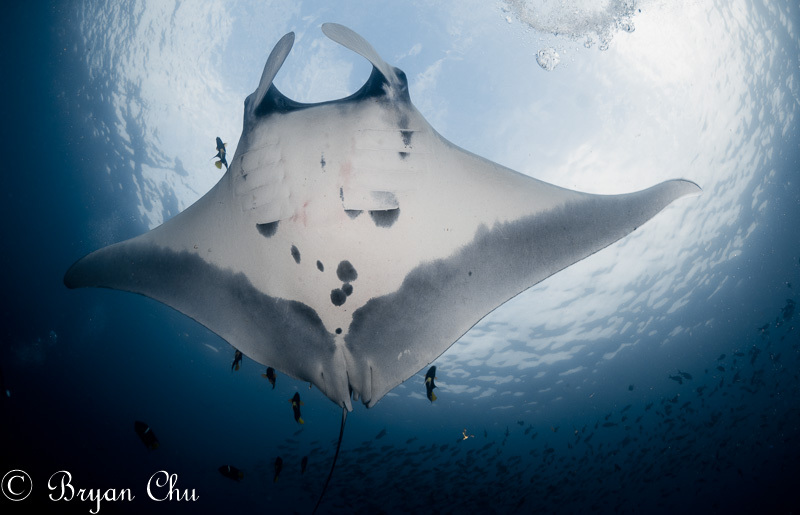 As the group headed for the manta, I headed off perpendicular to them, kicking as quickly as I could to get into a position where I thought the manta would pass over me. It swam around a bit, and then left behind the members of my dive group. At this point I realized it was coming right towards me! My heart was pounding, partly from the burst of speed and partly from nervousness for the upcoming moment. It kept coming straight at me as I made my final checks: proper exposure settings for a bright surface background, strobes on at the right power and fiber optics plugged in (you never know what can get bumped during a dive). 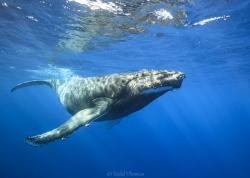 As it passed almost directly over me, I felt a level of breathless awe that went beyond me merely being out of breath. So cool. And fortunately, in the midst of this amazing experience, I remembered the most important part; hit the shutter button! Not perfect and not quite centered in Snell's window, but pretty decent! 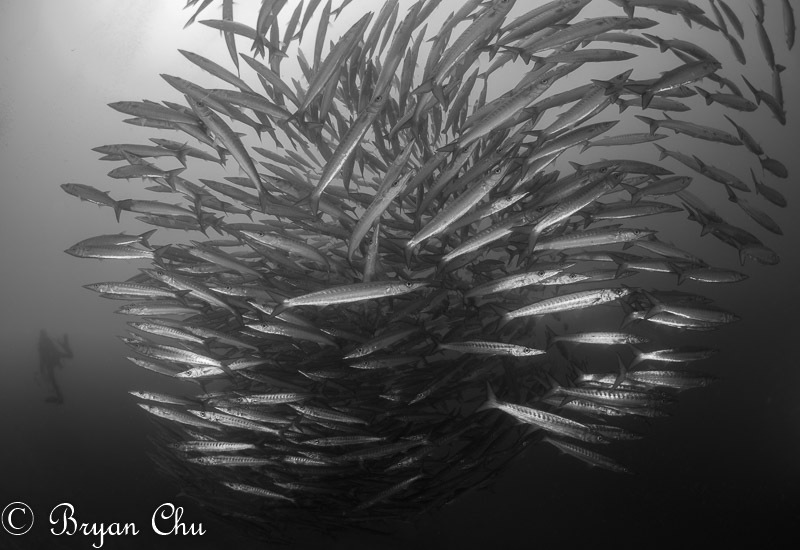 On a subsequent dive at Cabo Marshall we encountered a school of juvenile barracuda. I spotted it first and went right for it, taking a few decent photos, and my dive group followed. As others were lining up their photos, I checked mine; good, but not great. I knew what I needed to do to play to win, especially with the fisheye lens; get as close as possible to the school. No, even closer than that. So after the group finished, I went back to the school and swam straight at it. The barracuda were shy but as they got out of my way, they made some very cool patterns. This is what got the first photo in the article; again, not being satisfied with a decent shot, but looking for and working for that winning one. The playing to win mindset is risky, and you will miss some shots when doing it; I did not get any eagle ray photos the whole trip. And if I had screwed up that hammerhead photo or that penguin photo, I would not have gotten any of those either. But the point is, I was able to override my "playing not to lose" voice and I took a number of risks while playing to win. As an end result, I missed a decent number of opportunities, but also came home with a number of the best photos of my life. If your shot is decent, and you have an opportunity to experiment or improve, then do it! Don't worry if everyone else thinks you're being a weirdo - sometimes it will be worth it! Thanks for reading and I hope this helps you to take some cool photos! If you have any comments or questions I'd love to hear from you at bryan@uwphotographyguide.com. Shoot me an email (bryan@uwphotographyguide.com) if you plan on trying out any of these items or have any questions about the gear I used. My OM-D E-M1 rig is what I learned underwater photography on and I would love to chat about my experience and what you might be looking for! Same goes if you're looking at a Galapagos trip or you have one planned and want to know a bit more about what to expect.